…what are you waiting for? All you have to do is stop being who you think you are, and you couldn’t be more delightful! Because there’s nothing more beautiful than the uniqueness that God has created in us. It’s just buried like a diamond underneath a pile of garbage. That is not God’s fault, but the misuse of our freedom and the imposition on us of all the negative forces in the environment and our social milieu. It is a job to climb out of those influences. But all the work is in letting go of those influences and not reinforcing them. I am not in charge of my spiritual journey. I am not in charge of my life. I am not in charge of me. When it sinks in, my whole body relaxes. Its as if I have been holding my breath, efforting and toiling and then I exhale. It feels so beautifully freeing and frightening all at the same time. You can read it a hundred times. People can say it a million times but one day you know it and you are so, so relieved. Its not up to me! All I have to do is be there, be here, be available, show up, say yes. Say yes, even if at first its a whisper only God can hear. Beloved, grant that we may each know in the depths of our heart that we are infinitely loved. Amen. It is difficult to know what to do with so much happiness. With sadness there is something to rub against, a wound to tend with lotion and cloth. When the world falls in around you, you have pieces to pick up, something to hold in your hands, like ticket stubs or change. But happiness floats. It doesn’t need you to hold it down. It doesn’t need anything. Happiness lands on the roof of the next house, singing, and disappears when it wants to. You are happy either way. Even the fact that you once lived in a peaceful tree house and now live over a quarry of noise and dust cannot make you unhappy. Everything has a life of its own, it too could wake up filled with possibilities of coffee cake and ripe peaches, and love even the floor which needs to be swept, the soiled linens and scratched records . . . Since there is no place large enough to contain so much happiness, you shrug, you raise your hands, and it flows out of you into everything you touch. You are not responsible. You take no credit, as the night sky takes no credit, for the moon, but continues to hold it, and share it, and in that way, be known. This poem reminds me that of that popular, of the moment song, “Happiness.” I will try to post the video for you just in case you haven’t seen it and just because its joy is so contagious, you can’t help but be happified by it. The poem also reminds me that Love ALWAYS finds a way. Love just cannot be held back. I am a testament to this truth just as you probably are if you think about it. 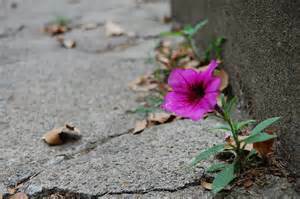 Have you ever seen a little bloom rising up between the crack of a concrete sidewalk? As a city dweller it is a sight I get to see often and it never ceases to inspire. It is reminder to me that Love finds a way and always wins. True, it may take a while and it most certainly requires a patient witness, but often when you least expect it, Love springs up. We may be going through a tough winter that never seems to end, and trying times in our lives, but take heart! And, I say this as much for me as for you, Love always, always finds a way.